The man in the navy blue Brooks Brothers looked at the two women sitting on the couch opposite him. “This is a very delicate matter,” he said. “I am not your client, rather I represent him. “If she’s missing, why doesn’t her family looking for her?” Virginia asked. “Not a fashion model, an artist’s model. She works at the various schools in the area and sometimes poses for professional artists. Here’s a picture.” He handed the detectives an eight by ten portrait of a young woman. “We’ll need an address,” Virginia said. “Not to mention a list of known associates and places she frequents,” Georgia added. The two detectives stood up, and there was a pronounced difference between the two. Virginia was short and curvey, while Georgia was tall and lean. They watched as Peters left the office. They decided to check Vivian’s apartment first. Neither of her two roommates were home at the time, so they had to rely on her neighbors. They found there was one thing they were not aware of: Vivian sometimes visited a place called Skivvy’s. Georgia had never heard of it, but Virginia had visited on occasion. “What is it?” Georgia asked. True to Virginia’s word, there was little activity at Skivvy’s when they arrived. A few regular customers sat at the tables and ate light meals. Behind the bar, a woman with short blonde hair was rinsing out some glasses. She wore a sleeveless leather top and a serious expression. “Why are saying all that stuff?” Georgia asked. “Private detectives. We’re looking for her.” Georgia produced the picture. “Thank you, we just might do that,” Virginia said. Several hours later, Virginia and Georgia returned to Skivvy’s. They found a table and waited for the show to begin. The first dancer of the evening was introduced as “Derek the Viking” and a muscular young man with long blonde hair and blue eyes came onto the stage clad in a furry loincloth and wearing a Viking helmet with cheesy plastic horns. He started to gyrate wildly as a horde of rotund woman came to the edge of the stage. “Subtlety is not exactly a strong point here,” Virginia said. Derek finished his dance and the next dancer appeared. He was billed as “Samurai Joe” and wore a Sumo wrestler’s loincloth while he waved a sword over his head. His physique was more that of a dancer than a true Sumo wrestler. “Chinese or Japanese?” Georgia wondered as she recalled the previous dancer. “Could be Korean,” Virginia said. Samurai Joe finished his routine and there seemed to an added excitement in the air. A disembodied voice announced “Chocolate Thunder” amid roaring applause a muscular black man in a spandex G-string appeared on stage. “You were right about them not being subtle,” Georgia remarked. A waitress appeared and asked them what they wanted to drink. She came back moments later with their drinks and an astonished look on her face “Tanya said you could have the first ones for free,” she said. “That should be obvious,” Virginia said. They got up and moved around the floor. “Do you think we should get lost on the way to or from the ladies’ room?” Georgia asked. Virginia carefully looked for a place where there was somebody acting as a guard in front of a doorway. The guard, presumably what “Chocolate Thunder” would be like with two left feet, let one of the dancers through. That was all the information Virginia needed. She rejoined Georgia and explained the plan. Virginia walked up to the guard, cocktail napkin in hand. “You can’t go in there,” he said firmly. Virginia tried to squeeze past him. “Okay, that’s enough,” he said and he dragged Virginia toward the door. As he did so, he failed to take notice of Georgia, who slipped behind him and into the backstage area. “Hey, what are you doing back here?” a voice demanded. Georgia turned and found herself face-to face with Derek the Viking, only this time Derek was in street clothes. “Oh, thanks,” he said and pocketed the cash. Georgia continued the search for anything that would give her an idea about what may have happened to Vivian. It was easy to keep quiet on the carpeted floor. She ignored the doors for the dressing rooms and looked for the door leading to the offices. With no prior experience in the place and lacking a blueprint of the building, she would try every door that wasn’t marked. As she reached for one door, she was grabbed from behind. 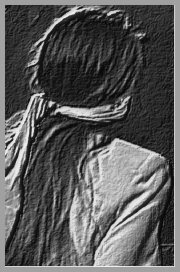 A rough hand was clamped over her mouth and a cloth secured over her eyes. She was pinned to the floor and another cloth replaced the hand. It felt as if somebody were sitting on top of her while her wrists and ankles were tied. Finally, she was lifted on top of somebody’s shoulders and carried. A door was opened and she was taken outside somewhere. Georgia was set down on a paved surface and heard nothing else from those who had grabbed her.